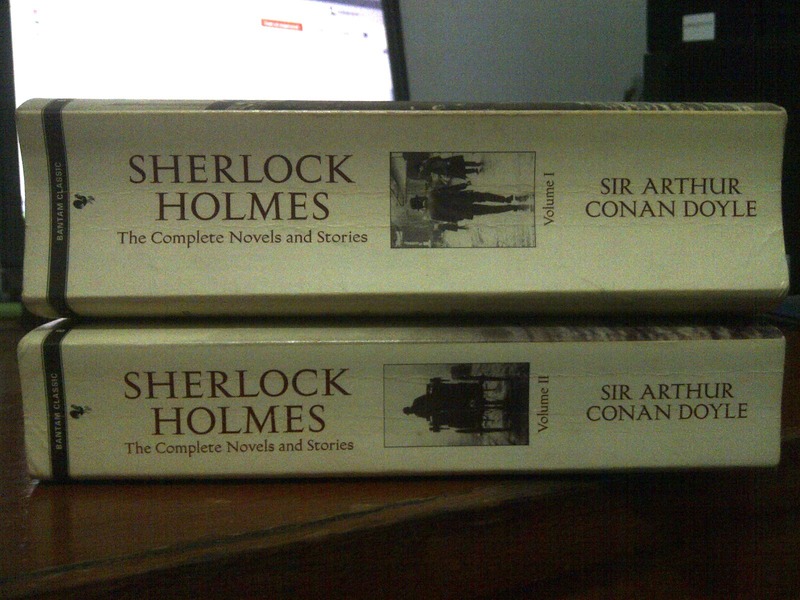 Sir Arthur Conan Doyle's Sherlock Holmes is probably one of the world's most popular fictional characters from a book, right next to J. K. Rowling's Harry Potter, Stephenie Meyer's Edward Cullen (ugh) and Suzanne Collins' Katniss Everdeen. Unlike the trio, however, Holmes has been around for more than a century and is right at the top of the A-list when it comes to detective fiction. He is immortal. Even to this day when thinking of a detective or a private eye, the image that comes to most minds is one of Sherlock in the London fog, all mysterious in his deerstalker cap and trench coat with its collar turned up, a pipe between his lips and a magnifying glass in hand. I first read Sherlock Holmes back in 2008 or 2009 when I was already so accustomed to my work as a customer service specialist at Convergys that I could do it while reading a book (or, sometimes, napping). Bantam Classics' two-volume Sherlock Holmes collection quickly became one of my favorites, and as with all my favorite books I'm a tad hypercritical when it comes to adaptations of it. I have only ever seen three Sherlock Holmes movie adaptations. There's the 1970 film The Private Life of Sherlock Holmes starring the late Sir Robert Stephens, which was boring, really, and not because it was old and in black-and-white but because it didn't really show much of anything in Holmes' private life as the title claimed. And of course we have the 2009 film with Robert Downey Jr., Jude Law and Rachel McAdams, and its 2011 sequel Sherlock Holmes: A Game of Shadows, both of which give Holmes, played by Downey with a convincing British accent, a too-bedraggled image. If there's one portrayal of my favorite fictional detective that I'd recommend to anyone in lieu of reading all the novels and short stories of him (though I'd most likely still insist that they read them), it would be BBC's Sherlock, a TV series I recently discovered through my online friend Mike. The crime drama takes place not in the late 1880s but in our present age, in clever modern parallels of the classic stories. I didn't think it was possible Holmes' so-called "science of deduction" can be used today, what with the plethora of possibilities any single observed detail can mean, but even when Holmes, played by Benedict Cumberbatch, makes use of the words "possibly" and "probably" in making his deductions, he's still spot on. He speaks fast, clearly trying to get out as much of the information his superior mind is processing as he can. He doesn't do many disguises, gets into very little fighting, but actually does play the violin, not just pluck its strings (yes, I'm looking at you, Downey). He is arrogant towards everyone, and why wouldn't he be? He is almost eidetic, a genius who without a case to solve might very well transform into a mad man. I'd marry his brain if he were real. Sherlock (Cumberbatch) in season 2's first episode, A Scandal in Belgravia. Sherlock effectively shows how Holmes and Watson (played by Martin Freeman) might have functioned if they were alive today. They address each other by their first names, for starters. They text, use computers, the Internet and GPS. Sherlock doesn't just keep his scientific findings about "243 different types of tobacco ash" in a notebook, but he blogs about it. 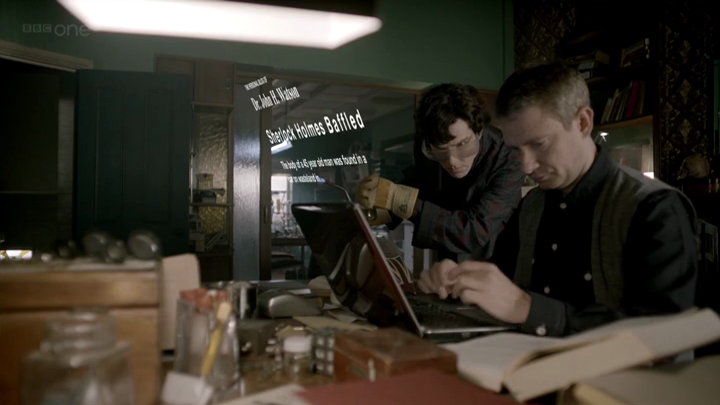 John likewise documents their adventures through a blog which boosts Sherlock's and his popularity as the series goes on. 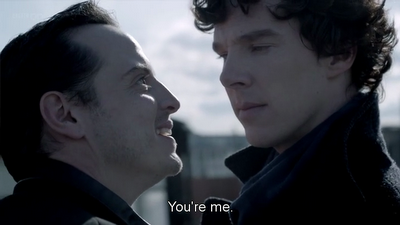 Sherlock and John (Freeman) in the season 2 finale The Reichenbach Fall. Some new characters join those from the books to make the show more interesting. There's Molly Hooper, a morgue attendant who helps in some cases, and Sergeant Sally Donovan from Scotland Yard who does not hide her contempt for Sherlock and refers to him as "freak" and "psychopath." Characters from the books include frail, old Mrs. Hudson, Sherlock's landlady at 221B Baker Street whom Sherlock treats as his housekeeper. Inspector LeStrade, Sherlock's connection to Scotland Yard and favorite detective to undermine. Mycroft Holmes, Sherlock's brother and connection to the British parliament. And of course, Jim (James) Moriarty, the only person who might be able to match Sherlock's intellect but who is unfortunately on the wrong side of the law. Andrew Scott (left) as Jim Moriarty, Sherlock's mortal enemy. The series also gets into issues Sherlock might never have needed to face back in the 1880s, such as his sanity, the media and the functionality of a deerstalker cap. And there's also his sexuality. Sherlock has little time to consider emotions, not even to treat John as one would treat a dear friend. He is smitten with Irene Adler, the only woman who has ever outsmarted him, yes, but since this is not publicly known, his constant proximity to John as both flatmate and partner-in-investigation and his apparent lack of interest in women, even Molly who has not kept her feelings for him a secret, of course raise eyebrows. The gorgeous Lara Pulver as Irene Adler. The series had its first run in 2010. Its second season aired early this year and has left its viewers wanting of a continuation to the finale where Sherlock supposedly committed suicide. Sir Arthur Conan Doyle, for those who haven't read the books yet, killed off Sherlock Holmes in The Adventure of the Final Problem because he didn't want the fictional detective to be all he is ever known for as an author. He later gave in to public demand, however, and brought Holmes back to life in The Adventure of the Empty House. 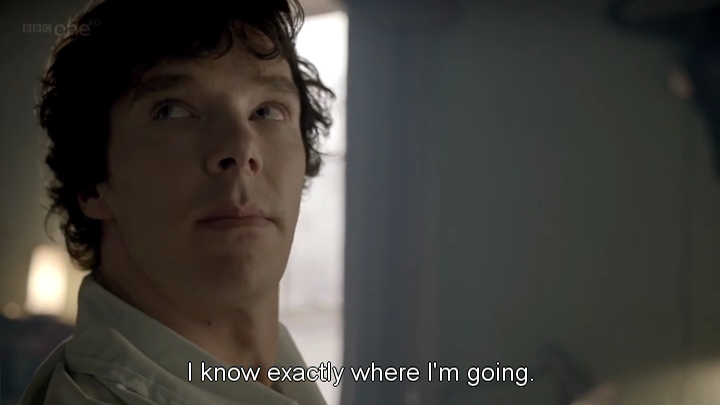 I'm curious to know how his resurrection will be explained in Sherlock's third season, due to come out in 2013. There are six episodes so far, three per season, and each episode is approximately 90 minutes long. For anyone who's only about to watch the series now, six episodes (or seven, if you count the alternate pilot version) might not be enough until the next season comes out, but you can watch them over and over again without getting tired of them. That's what I'm doing now. Sherlock's that good. Nice review of the BBC series. I too like this modern update of the canon. Have you tried the Russian adaptation with Vasily Livanov as Sherlock Holmes. existing at this web site is truly marvelous.